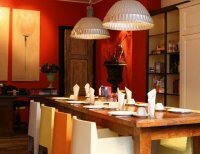 This popular gay hotel is located only steps away from the famous Club Church, Cafe Bump and Bar Spijker and Leidse Square. Breakfast is available until 13:00 in the afternoon. The renovated rooms of Amistad hotel are decorated with fresh colours and offer a PC with free internet access. There are coffee and tea facilities and a flat-screen TV. Breakfast is served in the Dutch-kitchen breakfast room. Amistad also offers a fax service, prepaid mobile phones and a laundry service. You can ask for extra pillows and blankets. The Prinsengracht tram stop is only steps away and offers easy access to Amsterdam Central Station and further districts. Amsterdam's gay street, the Reguliers Dwarsstraat, is a 5-minute walk away. Gay Hotel / Gay Friendly"
his unique hotel offers modern rooms with mood lighting, free Wi-Fi and a flat-screen TV with free on-demand films. CitizenM includes designer lounges and is 750 metres from the RAI Conference Centre. Each room at citizenM hotel Amsterdam City has wall-to-wall windows and an extra-large bed with luxurious linen. There is also a futuristic MoodPad to control lighting and music. The bathroom facilities consist of a transparent pod with a rain shower in the room. Amsterdam Zuid Railway Station is a 5-minute walk from citizen hotel. The Prinses Irenestraat tram stop is only 130 metres from the hotel. It offers direct connections to the city centre including Dam Square in 25 minutes and Central Station in 30 minutes. "Gay friendly, trendy hotel in good location"